We’ve all been there. You buy yourself a new chair, sofa, recliner, table, or any other piece of furniture, and the minute you place them on your carpet, they slide. Friction is rather non-existent, and you need stability. After all, you wouldn’t want any spilling or tumbling, would you? So the question most people have is: how can you stop your recliner from sliding on carpets? A variation of this includes hardwood floors instead of carpets and other pieces of furniture other than recliners. Read on and you will see a few solutions that can help you out with this issue. Usually, a piece of furniture stays affixed to the floor when bought. However, some simply tend to slide all over the place. The reasons for this are rather mundane. There are certain types of carpets that don’t provide much friction – they are smooth, not too shaggy, and not particularly rough. On the other hand, most wooden furniture tends to be coated to prevent the wood from rotting. This coating makes them slick and thus unstable on smooth surfaces. There are several options you can choose from, but before we move on to them, we should stress that there are two major ways of approaching this. One is the so-called “semi-DIY”, and the other is full DIY. 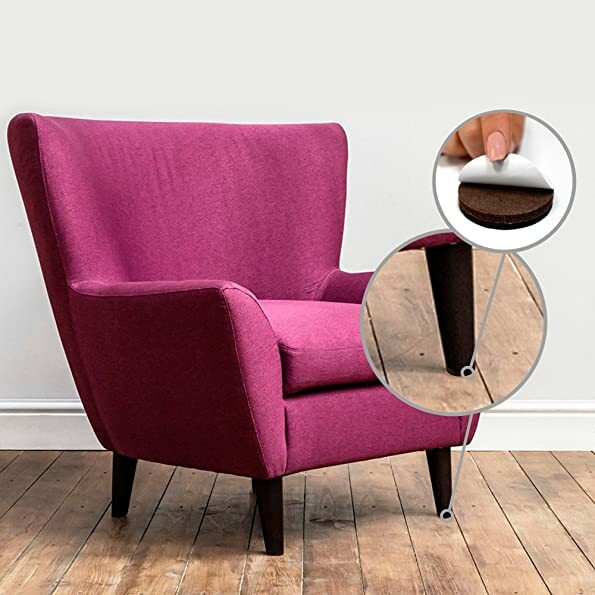 Semi-DIY refers to buying specific products for sliding prevention, which you affix to the chair yourself. The full DIY method is making and affixing additional parts to the recliner yourself. Both of these approaches require you to flip your recliner upside down. Other than a strong glue, you won’t be needing any other tools to finish this job. If you want to stop your recliner from sliding on carpets, this is literally the go-to solution. You can find furniture grippers on Amazon or in local hardware stores everywhere. Usually, they sell in sets of four and up and can cost anywhere between $3 and $15. What you do with them is affix one to each of the recliner’s legs. Naturally, make sure the non-sliding side of the gripper is facing away from the leg, where the floor should be. If affixed properly, your chair should not move from the carpet. Furniture grippers come in various materials. Most of them are plastic or silicone based, though there are some made of cork or softer wood. It’s important to know which material will work with the carpet you’re already using. For example, if your recliner has wooden legs, it’s best to go with plastic or rubber grippers. Most of them also come in a wide variety of shapes. Commonly they are round, but square and rectangle ones are also on the market, largely for tables and regular chairs. If you’re looking for a specific brand of these grippers, the US-based Stay! brand has you covered. They specialize in a wide variety of grippers and their products can be found anywhere in regular retail. There are folks out there who would prefer not to spend money on grippers. If you fall into this category, there’s a way you can save money and even repurpose some old products. It’s not uncommon for DIY craftspeople to make their own grippers. It’s an effective and cheap way to stop your recliner from sliding on carpets, so why not do it? Again, you should think of materials. Cork is probably your safest bet, and you can get it at most DIY stores. Other types of softwood can also work. What you should do is measure the size and shape of your potential gripper and use any appropriate tools to make it. Think hacksaws or scalpels, or even scissors for softer items. An effective homemade gripper is usually from the same material your carpet is made of. Should you have some lying around, you can cut out the portion you need and super-glue it to a flat hard surface. Once it hardens, affix it to the legs of your recliner. Most of the techniques listed here to stop your recliner from sliding on carpets can also be applied to other pieces of furniture, like rocking chairs, tables, wardrobes, etc. Not only will they keep your furniture in place, they will not do damage to your carpet and add a few extra inches of height to your stuff.